I heard that Cohen tape, and he is obviously the type of thug that Trump enables and encourages. I wonder if Trump is on those tapes. I'm asking because since the news about the Cohn tapes, Trump started giving out pardons like free ice cream. That is exactly what Trump fears. That's the reason for the pardons, the get-out-of-jail card to send a message to Cohen. Here's the thing, Cohen is not off the hook in regards NYS going after him.. Isn't it obstruction of justice when you pardon a person that is relatable to issues dealing with himself? According to Michael Avenatti, Crooked Donnie can be heard on the tapes. Happy Birthday, for example. A real nothing burger. 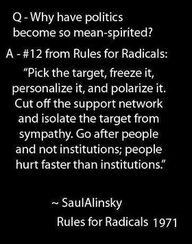 Why con artists like Crooked Donnie love Saul Alinsky. I read somewhere that one of the investigations is sharing info with the NYS AG, just in case the NYS AG wants to file state charges. Which you have already mentioned that Trump has no pardon powers in that jurisdiction. So according to Lying Donnie, everybody is a liar except the biggest liar of them all: LYING DONNIE. Ryan on Wednesday called Gowdy’s assessment “accurate,” dealing another blow to the claims dubbed “spygate” by President Trump. But Trump allies on Capitol Hill say Gowdy, a former prosecutor, defended the FBI before reviewing key underlying documents — and they are furious that Ryan has backed him. (Thinkk Progress) In a series of exclusive interviews, former Fox News Channel chief political correspondent Carl Cameron explained to ThinkProgress how the Russians coordinated their cyber attack on the 2016 election with the Trump campaign. In his interviews with ThinkProgress, Cameron, who covered the Trump campaign for Fox News, connected the dots between the campaign, Russian intelligence, and the various Russian trolls around the world who were creating and viralizing memes and fake news on social media to help elect Trump. I'm sure the cons are calling these former Fox News people for starting to come clean on what Fox has been doing, all traders... When we all know who the real traders are, most reside in the White House and Congress now..